Some time back, we covered a vintage travel poster auction at Christies – and pinpointed the 50s/60s work of British artist and designer Royston Cooper as shrewd investments. 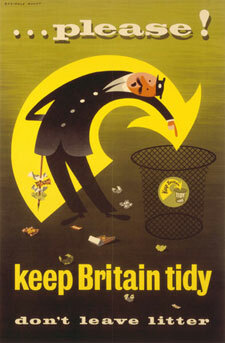 Similar in style (and era) is this Please… Keep Britain Tidy poster by Reginald Mount. Like Cooper, Mount is famous for public information posters – and this anti-litter poster, available from the V&A, is fantastic and quirky example of the era – seen around the country between 1950 and 1955. While it’s unlikely to make you money (like an auction-bought original), it’s great value art for your wall. Prices start at £5 for the 5" x 7" version, rising to £50 for the largest version, which comes in at 30" x 20".